One of my favorite things to do on any given weekend is cooking for my family. It is something I look forward to, and as soon as my kids wake up and say good morning, I immediately question them with ‘what can I make you for breakfast?’. I await a challenge, hoping that someone might say ‘how about eggs benedict?‘ or ‘toad in a hole?‘. Nope. I get things like scrambled or sunny side up eggs with toast, or pancakes. Heck, I will even get excited if someone says waffles! I then make another attempt at lunch time. That’s when I got a sell from my wife. After we tried the Nueskes’s smoked duck breast the other week, I knew it would be perfect on a sandwich, and as I had that to use up along with a tomato and an avocado, well I knew exactly what I was going to propose to my wife for lunch. 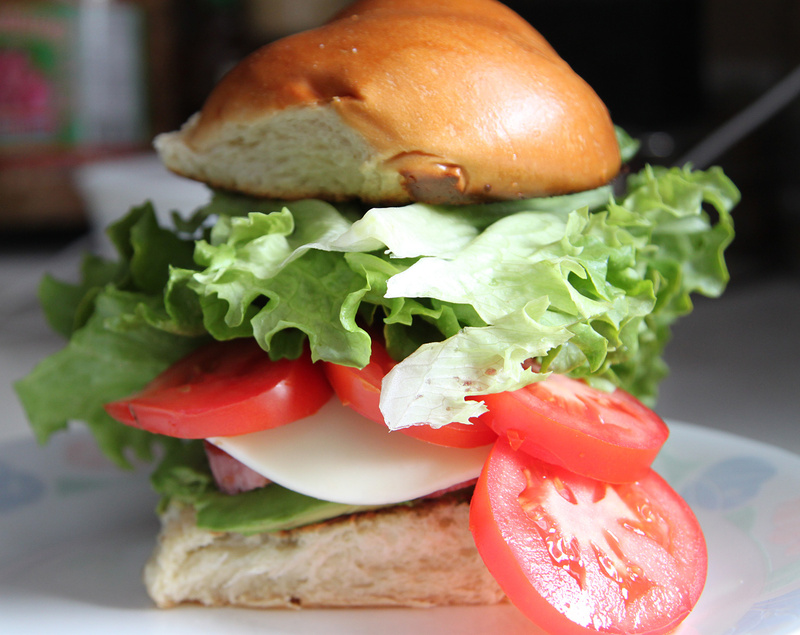 A loaded Duck, Avocado, Lettuce, and Tomato sandwich! Start by having everything ready to layer in your sandwich. Heat a skillet on medium heat, and add in the canola oil. Add the slices of smoked duck breast, moving them around the skillet, and sear for a couple of minutes on each side. Take the bottom bun of your lightly toasted bun and layer on, or smear on the avocado. Season with a pinch of salt. Next layer on the slightly crispy Nueske’s smoked duck breast, provolone cheese, tomatoes (season with a bit of salt and pepper), then the stack of lettuce. Place on the top bun, and feel free to smash it slightly into shape. You want mayo (I love it, my wife does not), feel free to slather it on the bun(s). Now I knew this was going to be a phenomenal sandwich. How? Well in my book, nothing really beats a BLT, especially when you have great produce, but then I was introduced to the Nueske’s smoked duck breast and it was a total game changer. My wife who did not speak much during her lunch… well that is always a great indicator how awesome that sandwich was. Search for Nueske’s and stock up. I have never, ever been disappointed. Hope you enjoy! This was so delicious!! The Nueske’s duck was so good. Thank you for making this! !